Aim: To measure the light transmission through different esthetic posts and to evaluate the degree of polymerization of dual cure resin cement cured through these posts. Materials and Methods: The posts were divided into two experimental groups i.e. Group A (D.T. Light post); Group B (D.T. White post) and control i.e. Group C (metal post), each group having 10 samples. Posts of each group were illuminated with curing light and photographs were taken keeping the parameters standardized to evaluate the intensity of light transmission at different levels. The degree of polymerization of dual cure resin cement was evaluated using Fourier Transform Infrared spectroscopy. The data obtained was subjected to statistical analysis. Results: D.T. Light post showed highest light transmission and degree of polymerization. The light intensity decreased from cervical to apical for both esthetic post but the decrease from middle to apical third was insignificant for D.T. White post group. No light transmission was detected in metal post but the degree of polymerization decreased significantly from cervical to middle third. Conclusion: Cementation of fibre post with superior light transmitting ability using dual cured resin cement resulted in increased degree of polymerization. Keywords: Light transmitting post, dual cure resin cement, transmission of light, degree of polymerization, fourier transform Infrared spectroscopy. The posts are commonly used to restore endodontically treated teeth when the remaining coronal tissue is insufficient or inadequate, to provide adequate support and retention for the restoration. Nowadays, translucent fiber posts in conjunction with dual cured resin cement are preferred. The rationale of using dual cured resin cement is to have a material with extended working time, which is capable of polymerization by both chemical and light activation. However, many studies have proved that autopolymerizing alone does not provide the adequate degree of conversion for the dual cure resin cement. ,, Some dual cure resin cements are primarily dependent on light activation, so an inadequate degree of conversion is expected when light for initiation is not available. The property of translucency of light transmitting posts proves favorable for luting purposes, as the transmission of light through the post, into the depths of the root canal, allows adequate polymerization of the dual cure resin cement. However, light intensity declines rapidly as the distance from the light source increases, because of light scattering within the resin cement and shadowing produced by both the tooth structure and post. Therefore, light intensity may be insufficient for the complete curing of resin cement at the apical end, which might lead to inferior physical  and biological  properties. There are very few studies that have evaluated the light transmitting properties of fiber posts and the degree of conversion of resin cements cured through these posts simultaneously. Moreover the methodology is different and the standardization of the shape and size of the posts has not been taken into consideration. Therefore, this study was taken up to measure light transmission through similar shaped DT Light and DT White posts and also to evaluate the degree of polymerization of al cure resin cement cured through these posts, by using Fourier Transform Infrared Spectroscopy (FTIR). The translucent quartz fiber DT Light post (RTD, France) and DT White post (RTD, France) were used in this study. Both the fiber posts were 20 mm long, double tapered and identical in shape and size, having a diameter of 2.2 mm cervically and 1.2 mm apically. For the control group, customized metal posts of identical shape and size were fabricated. The posts were divided into two experimental groups, that is, Group A (DT Light post), Group B (DT White post), and control, that is, Group C (metal post). Ten posts from each group were used for evaluating light transmission and the same ten posts from each group were used for evaluating the degree of polymerization of the dual cure resin cement around different posts. A light box was constructed, to ensure light-proof surroundings and to measure the intensity of the transmitted light. All parameters of photography were standardized. Posts of each group were placed in the light box through a silicon stopper and were illuminated with curing light (Mini L.E.D. Satelec). Pictures of all samples of each group were taken with the camera (DSLR D80, Nikon U.S.A), in a dark room. Transmission was documented in the form of photographs. These photographs were first converted to grayscale using the MATLAB 7 software. A straight line was drawn in the center of the photograph of each post and then 1200 values of intensity were obtained from one end (coronal) to the other (apical), through each photograph. The first 300 values corresponding to 5 mm, which would be outside the post space, were not taken into consideration. The remaining 900 values were divided into three parts. The first 300 values were assigned to the cervical, the next 300 to the middle, and the last 300 to the apical third of the post. An average of 300 values was calculated as intensities, at different levels for all the posts. Thirty molds (10 for each group), with a simulated post space 15 mm long and a diameter of 2.5 mm, were prepared in a separable hollow metal jig using polyvinyl siloxane impression material. Dual cure resin cement (Relyx Unicem, 3M ESPE, Germany) was mixed according to the manufacturer's instruction and placed in the prepared post space of the mold with the help of a capsule applier. The post of the respective group was placed in the center of the prepared post space using the centring hole of the lid of the jig as the guide. The resin cement was light cured for a standardized time of 40 seconds, with the tip of the light curing unit (Mini L.E.D, Satelec) touching the extruded post. The output intensity of the curing unit was consistent throughout the experiment, as measured by the radiometer. After light curing, the molds with cemented posts were kept in a light proof container for 24 hours to allow for complete polymerization. where R is the peak height at 1,638 cm -1/ peak height at 1,608 cm -1 . The mean value of DC% was calculated as a mean of ten readings corresponding to ten samples. The data obtained was subjected to statistical analysis using One-Way Analysis of Variance (ANOVA) with Post Hoc analysis (Bonferroni), for comparison of the means. The Pearson correlation test was applied to see the correlation between the transmission of light and degree of polymerization. The DT Light post showed the maximum light transmission. 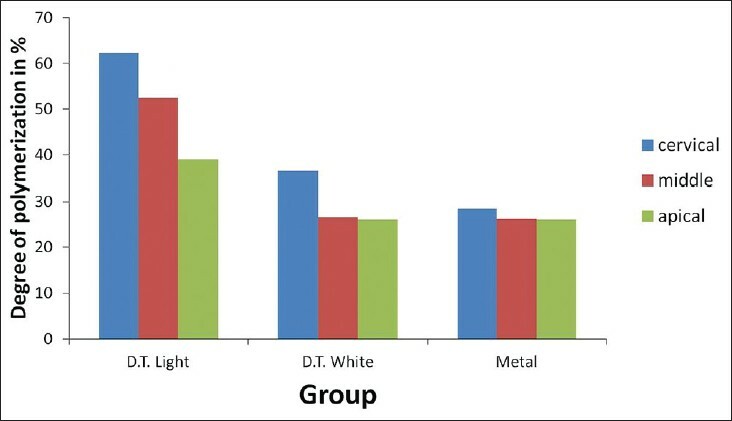 The light intensity decreased from cervical to apical for both the DT light post and the DT White post, but there was insignificant difference between the middle and apical third of the DT White post group. No light transmission was detected in the metal post [Figure 1]. The highest degree of polymerization was shown by the DT Light post group. 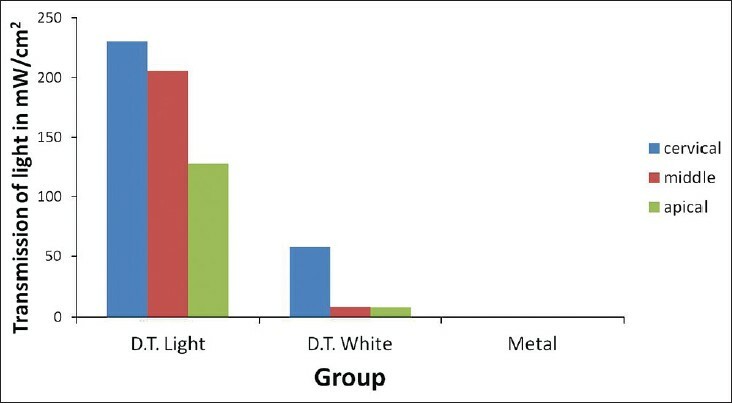 The degree of polymerization decreased significantly from the cervical to the apical for the DT light post group, but the DT White post and metal post group showed insignificant difference between the middle and apical third [Figure 2]. Significant positive correlation was found between the transmission of light and degree of polymerization. In this study there was no light transmission at any level of the metal post in the control group because of its non-light transmitting property. The light transmission for DT Light post was found to be significantly greater (P < 0.05) than that of the DT White post at all levels. This could be due to the difference in the chemical composition of the posts. The quantity of light that would be absorbed, reflected, and transmitted seemed to depend on the resin matrix and on the fiber composition of each post. The light transmission of the DT White post was extremely low due to its opaque nature and the presence of a large number of white quartz fibers embedded in an epoxy resin matrix. The difference was in the agreement of the results of Kim,  who showed that the DT Light (translucent) and FRC Postec (translucent) posts revealed higher light transmission than Snowpost (opaque) post. The intensity of light decreased from cervical to apical for both the DT Light post and the DT White post. The difference was significant for the DT Light post at all the three levels (P < 0.05). This difference in light transmission at the three levels could be attributed to the decrease in intensity of light as the distance from the light source increased. It was found by Felix and Price  that light intensity decreased as the distance increased for all types of light, and this effect was due to the dispersion of light. Our results were consistent with the findings of other studies, which reported a decrease in light transmission in the fiber post from the coronal to the apical. ,, For the DT White post, the light transmission at the middle third was not significantly different from that in the apical third, which showed negligible light transmission. This finding was in agreement with Friedrich and Patyk,  who demonstrated that the Para Post Fiber White (opaque) post resulted in total lack of light emission in the middle and apical thirds. This study demonstrated that there was a positive correlation between the extent of light transmission and the degree of polymerization of resin cement. The degree of polymerization decreases from cervical to apical for all the groups. This difference in the degree of polymerization at different levels may be attributed to the difference in light transmission of the post at different levels. The more intense the light source, the more are the photons accordingly available for absorption by the photo sensitizers. This help to form free radicals, to initiate and propagate the polymerization process. Also, at the surface of the resin, polymerization is more efficient because of the ample number of photons provided directly from the light source. The decrease in the degree of conversion of dual cure resin cement from coronal to apical is in agreement with the other studies. , Teixera and others  have found that Vickers hardness number, which indirectly reflects the degree of polymerization of dual cure resin cement and cures through a translucent fiber post (DT Light) is highest in the coronal third, followed by the middle, and then by the apical third regions of the root canal. An important finding of our study was the fact that although the mean degree of polymerization achieved in DT Light at the apical third (38.96%) was greater than the DT White and metal, it was still not adequate for the optimum mechanical properties. The difference in the diameter of the post at three levels resulted in a different thickness of cement around it. This was one of the limitations of our study. Caughman and others,  in their study, found a maximum degree of conversion of dual cure cement when the thickness of composite restoration above it was 3 mm. In our study the maximum thickness of dual cure resin cement was 1.3 mm and it was in direct contact with the post. Thus, it is expected that a difference in thickness of 1 mm of dual cure cement will not have any impact on the degree of polymerization. As only one dual cured resin cement was evaluated in this study, these results cannot be extended to other dual cured cements. Although there is a relationship between the extent of resin cement, degree of polymerization of resin cement, and physical property improvement, care must be taken not to attribute clinical success to conversion values. Further clinical studies are required to substantiate the findings of this study. The degree of polymerization of dual cure cement around the esthetic post is dependent on the intensity of light transmitted through these posts. 1. Rueggeberg FA, Caughman WF, Curtis JW Jr. Effect of light intensity and exposure duration on cure of resin composite. Oper Dent 1994;19:26-32. 2. Caughman WF, Chan DC, Rueggeberg FA. Curing potential of dual-polymerizable resin cements in simulated clinical situations. J Prosthet Dent 2001;86:101-6. 3. Braga RR, Cesar PF, Gonzaga CC. Mechanical properties of resin cements with different activation modes. J Oral Rehabil 2002;29:257-62. 4. Hofmann N, Papsthart G, Hugo B, Klaiber B. Comparison of photo-activation versus chemical or dual-curing of resin-based luting cements regarding flexural strength, modulus and surface hardness. J Oral Rehabil 2001;28:1022-8. 5. Janke V, von Neuhoff N, Schlegelberger B, Leyhausen G, Geurtsen W. TEGDMA causes apoptosis in primary human gingival fibroblasts. J Dent Res 2003;82:814-8. 6. Kim YK, Kim SK, Kim KH, Kwon TY. Degree of conversion of dual-cured resin cement light cured through three fiber posts within human root canals: An ex vivo study. Int Endod J 2009;42:667-74. 7. Felix CA, Price RB. The effect of distance from light source on light intensity from curing lights. J Adhes Dent 2003;5:283-91. 8. Radovic I, Corciolani G, Magni E, Krstanovic G, Pavlovic V, Vulicevic ZR. Light transmission through fiber post: The effect on adhesion, elastic modulus and hardness of dual-cure resin cement. Dent Mater 2009;25:837-44. 9. dos Santos Alves Morgan LF, Peixoto RT, de Castro Albuquerque R, Santos Corrêa MF, de Abreu Poletto LT, Pinotti MB. Light transmission through a translucent fiber post. J Endod 2008;34:299-302. 10. Goracci C, Corciolani G, Vichi A, Ferrari M. Light transmitting ability of marketed fiber posts. J Dent Res 2008;87:1122-6. 11. Frieddrich M, Patyk AJ. Translucency of glass-fiber-reinforced root canal posts. Int Poster J Dent Oral Med 2005;4:poster 294. 13. Yoldas O, Alaçam T. Microhardness of composites in simulated root canals cured with light transmitting posts and glass-fiber reinforced composite posts. J Endod 2005;31:104-6. 14. Sigemori RM, Reis AF, Giannini M, Paulillo LA. Curing depth of a resin-modified glass ionomer and two resin based luting agents. Oper Dent 2005;30:185-9. 15. Lu H, Mehmood A, Chow A, Powers JM. Influence of polymerization mode on flexural properties of esthetic resin luting agents. J Prosthet dent 2005;94:549-54. 16. Vinoth Kumar TS, Shyamala PV, Kavitha S, Lakshminarayanan L. In vitro evaluation of degree of conversion of various luting resins at different levels of post space using FTIR spectroscopy. Endod 2008;20:37-43. 17. Teixera CS, Sousa YC, Sousa-Neto MD. Effects of light exposure time on composite resin hardness after root reinforcement using translucent fiber post. J Dent 2008;36:520-8. 18. Kumbuloglu O, Lassila LV, User A, Vallittu PK. A study of the physical and chemical properties of four resin composite luting cements. Int J Prosthodont 2004;17:357-64. 19. Ferracane JL, Greener EH. Fourier Transform Infrared analysis of degree of polymerization in unfilled resins-methods comparison. J Dent Res 1984;63:1093-5. Taneja, S. and Kumari, M. and Gupta, A.